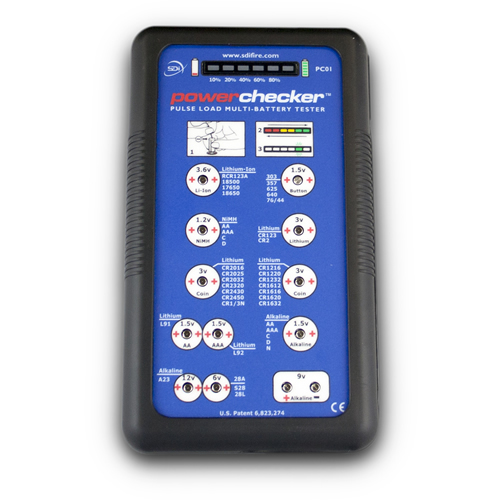 Powerchecker™ provides a comprehensive means of testing the state of charge or state of power for more than 30 battery types. This microprocessor-controlled instrument is designed for commercial or home use and tests popular primary (non-rechargeable) and rechargeable batteries using a patented, high accuracy pulse load test. After a fully automatic test cycle, percentage of remaining battery capacity is indicated on the LED bar display. Battery types are clearly labeled next to appropriate contacts. The negative test lead/probe conveniently stores in seam at side. It’s easy to use, and test results are easy to understand. Tests NiMH, Li-Ion, alkaline, lithium, coin cell, button type and more. Requires 4 AA batteries (not included). The SDi powerChecker is ideal for testing all batteries used in emergency, fire alarm, security systems, and electrical appliances.